Their idea involved combining air and sea transportation: flying over the expansive ocean to deliver travelers to a waiting ship in Antarctica. This would avoid the difficult and uncomfortable navigation across the Drake Passage, while also reducing the total duration of the trip by four days. Like any fledgling project and given its uniqueness, the idea was received by the industry with some skepticism. Despite this hesitations, in November 2003 ANTARCTICA 21 began operation of its first air-cruise. A De Havilland Dash-7 aircraft left from Punta Arenas and landed at the Lt. Marsh Airfield on King George Island, Antarctica. 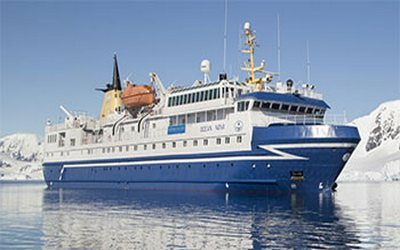 There, clients boarded M/V Grigoriy Mikheev and spent six days visiting the South Shetland Islands, crossing the Bransfield Strait, and then sailing along the western coast of the Antarctic Peninsula. 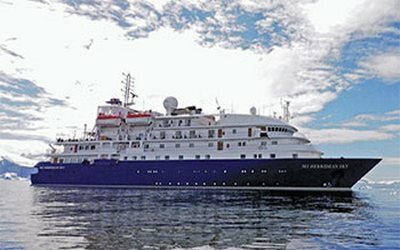 More than a decade later, ANTARCTICA 21 now offers over 20 air-cruise departures each season aboard two different ice-class expedition vessels. Thanks to our tireless expedition staff and our superior service, ANTARCTICA 21 offers the most extensive suite of Antarctic air-cruises in the world. We are proud of this achievement and we continue to improve. As the leading boutique Antarctic tour operator, we are constantly striving to innovate and develop our environmentally-responsible expeditions to the bottom of the world.